Analyzing this data, the Pathfinding Team began to think of these differences as technology orientations. Content creators who built their own PC towers using components they bought on the Internet, and who were focused on extreme computational power, graphics capability, and RAM, the team called Tech Whizzes. A pair of American virtual reality startup developers explained, “It is about how much power we can have in a single workstation. 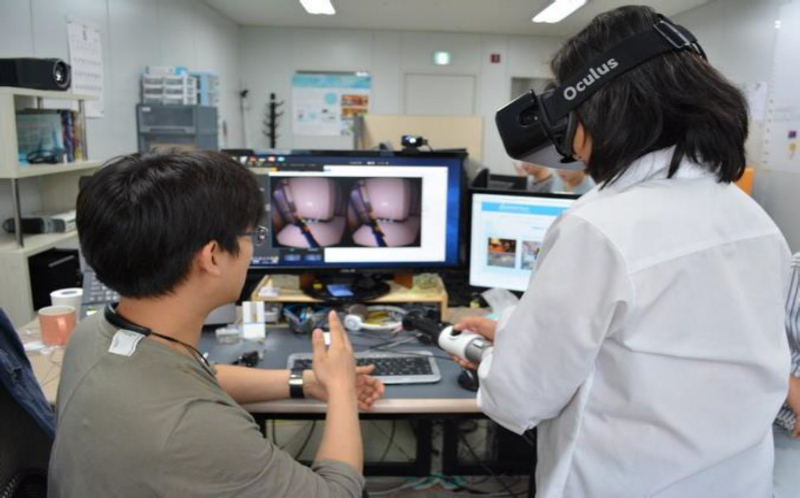 Having stable, reliable computers that are powerful is paramount to what we do.” Figure 4, below, shows the office of a Korean Tech Whiz who received a government grant to develop virtual reality applications to train emergency personnel in firefighting techniques. Figure 4. Tech Whiz CEO of a VR startup in Seoul, South Korea (left). He built all the computers used in his small company of eight people. Figure 5. 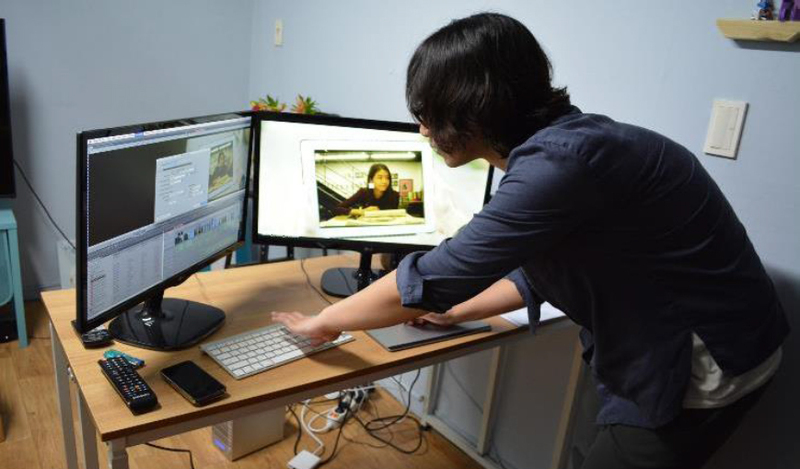 A Minimalist TV and film editor in Seoul, South Korea who consulted with friends and mentors when buying technology for her studio. Creating computer graphics is her least favorite part of her job. Figure 6. 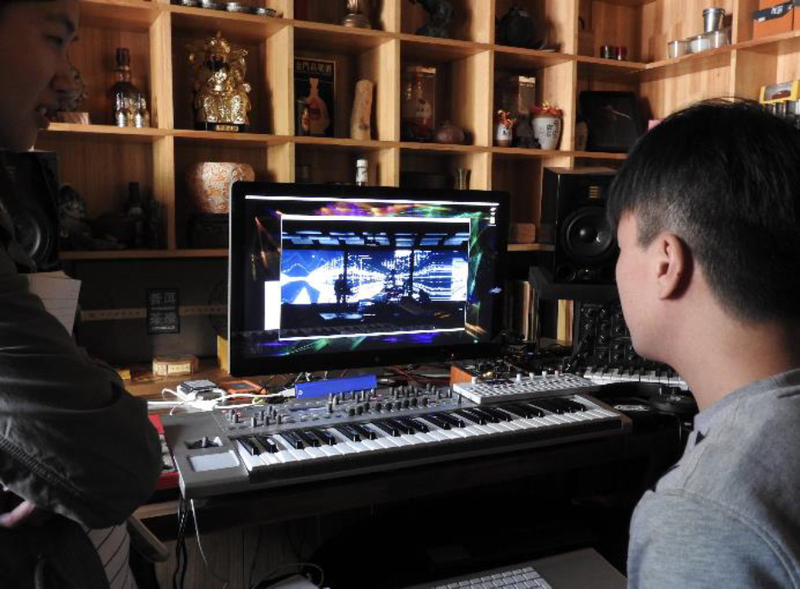 A Specialist audio musician in Shanghai needs to connect keyboards and other hardware extensions that require him to understand technical details; he would rather just focus on the creation of music. This model was a major change from how Intel had traditionally thought about consumers. The technology orientations cut across professional standing; they apply to creators whether they are professionals, prosumers, or mainstream creators. In collecting biographical stories of how participants came to be professional content creators, and in interviewing Gen Z creators, for whom the value they derive from their activities rarely qualifies them as “professional’ or even “prosumer,” it was clear to the team that these orientations cut across professional standings. Tech Whizzes tended to be Tech Whizzes long before they became professional content creators, and many successful professionals remained Minimalists. While Specialists’ expertise tended to grow alongside the sophistication of their work, and was thus loosely linked to professionalism, it was significant to the team that the acquisition of knowledge was driven not so much by professional advancement as by the complex nature of the work they were trying to get done. Each segment has a different relationship to technical complexity – Minimalists do not want any complexity in their tools and systems, Specialists need complexity in certain discrete parts of their systems, and Tech Whizzes thrive on complexity across multiple machines, software programs, and other tools (Figure 7). Figure 7. Technical Orientation overview to explain the differences between each segment. The Pathfinding Team determined that professional content creators are more diverse than Intel previously thought. Professional does not always equal tech savvy, contrary to the company's longstanding assumption. While taking into account the findings from the team's pilot studies and past studies on content creation, it was clear that a mainstream, non-professional content creator is not always tech ignorant. There are degrees of tech literacy throughout the large market of digital content creators. Furthermore, the tech orientation framework proved to be a valuable tool in thinking about how to message to, and market to content creators. It is both a model and a finding that was a useful way for the Pathfinding Team to make sense of what they had learned, and communicate it to the rest of the company. It gave the team a way to talk about the research that was actionable. Creators are Not the Same as Gamers – In addition to the insights around technical orientation, the research showed clearly that digital content creators are not the same as gamers. Contrary to a longstanding Intel assumption, digital content creators did not want to buy gaming PCs and would not respond to advertising and messaging aimed at gamers, even if they played games in their spare time. Creators (both professional and Gen Z) identified as creators, and wanted devices that were sleek, stylish, high-end and devoid of gamer-oriented ornamentation like flashing lights, skulls, and dragons. A Chinese industrial designer told the team, “I hate Alienware because of all the flashing lights.” An American 3D-modeler expressed frustration with computers optimized for his work saying, “What I'm buying is geared toward gaming, and it feels patronizing. I hate buying hardware from companies that look like they should be selling Airsoft guns.” Despite enjoying gaming in his free time, he did not want to do his digital content creation on a gaming machine. Culture also played a part in participant attitudes about gaming and content creation. In China, for example, where career choices and purchasing patterns alike were more strongly shaped by professional and social role than by concepts of personalization, participants were particularly averse to computers designed for gaming, seeking instead those they felt were “best for design” which they perceived as categorically different from gaming machines regardless of technical specifications. Cultural Differences – While the Pathfinding Team's efforts were aimed at understanding digital content creation practices ethnographically and cross-culturally to tease out common patterns and concerns, understanding how these patterns played out in different geographical and cultural contexts was central. The Tech Orientation framework as a segmentation highlights relevant differences for the digital content creation market that cut across geographic boundaries. Cultural differences between someone in Los Angeles and someone in Shanghai were not relevant to the creation of the segments for the global market of digital content creators. However, as in the point made above regarding perceptions of gaming and design oriented hardware in China, the team also found important social and cultural variations. That material was used internally to talk about different go-to-market strategies and advertising methods and messages. In China, for example, enormous value was placed on the newness of a computer. Content creators preferred to buy a less expensive, less powerful machine on a more frequent cadence rather than buying the top-of-the-line and keeping it for several years. The head of a Shanghai design start-up said, “We were planning to buy a 100,000 RMB computer, but we want to try the 10,000 RMB one first.” He hoped the much less expensive machine would be good enough for the short time he planned to use it. The value Chinese content creators placed on getting a good deal economically, coupled with their perception of quick cycles of obsolescence, led them to buy the least powerful, least expensive machine that could get the job done. They upgraded machines often because the next generation was expected to be better in both performance, and in the optics of success, where newness signaled to others that their business was doing well. In South Korea content creators tended to maximize their purchase and buy the best machine they could afford. A Korean virtual reality developer told the team, “I want my PC to be a beast.” Similarly, in the US, where “time is money” and the most expensive part of any project was the cost of human labor, content creators tended to buy the most powerful machine they could afford with the understanding that time saved on processing media translated directly into savings for the creator. In addition, even for non-professionals, generational product differences between computer processors were seen as so small and incremental that it was better to buy a more expensive, more powerful machine, and keep it longer. One of the findings that surprised the team was the relative absence of Tech Whizzes in Shanghai. Regardless of a highly entrepreneurial spirit, and strong value placed on resourcefulness and economy (two values cited by many Tech Whizzes), and despite a few participants who mentioned having built computers from scratch in their youth, content creators in China did not tend to orient toward technology in this way. Why? The explanation for this lies in the confluence of social, cultural, and economic structures that undermine the financial and social value of being a Tech Whiz. From a socio-cultural perspective, Chinese communities place higher emphasis on the ties that bind people together than on self-reliance as an individual trait, as in the United States. Whereas in the United States, Tech Whiz stories about themselves emphasized both the economic advantages of “building one's own,” and the satisfaction of individual accomplishment, for Chinese participants, there was no particular personal value or social capital associated with building a PC. Instead, participants often made purchase decisions on the basis of advice from a friend or colleague, and resourcefulness was demonstrated in collective ways, by leveraging the skills and ties of one's social and professional network, rather than one's individual accomplishments. The solicitation and giving of advice on the “best” device to buy served to strengthen the network ties between people. In addition, in the Chinese market, desktop computers are generally custom built by local sellers, who include the assembly of the system as a free service when purchasing a computer. Thus, Chinese buyers reaped the economic benefits of building their own, with neither the practical need nor any special social cachet attached to deep technical know-how. However, because PC sellers were generally outside the personal network of content creators, their advice was seen as untrustworthy. One Chinese social media broadcaster told the Pathfinding Team that she needed a more knowledgeable friend to go with her to the PC mall when she wanted to purchase something to make sure that she wasn't cheated. Thus, the role of Tech Whiz in China is actually distributed across a number of actors including knowledgeable friends, colleagues, and custom PC sellers. 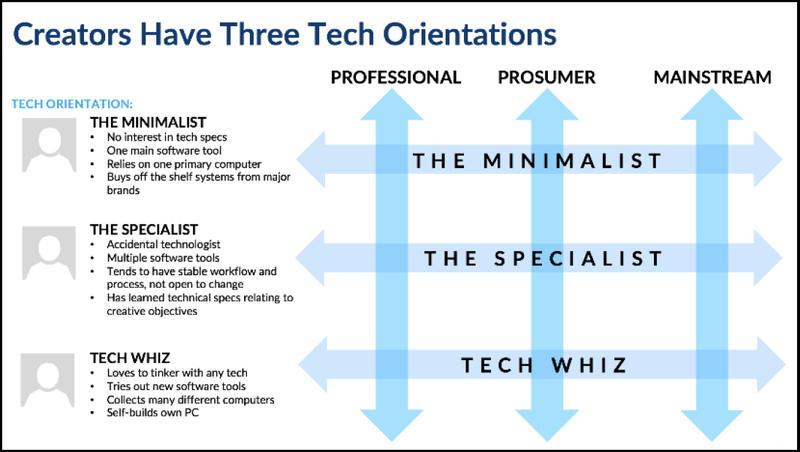 Tech orientations themselves are not simply characteristics inherent to personalities, but a product of various cultural, social, and economic forces as well. For Intel, the particulars that make Tech Whizzes rare in China are less relevant than the implications of the particular arrangement of social and economic dynamics that shape how content creators make purchase decisions. It means that influencers (knowledgeable friends and PC sellers) are extremely important, and that broad campaigns focused on technical specifications are less likely to be successful than word of mouth and branding efforts that focus on defining “best in class” for specific creation purposes. The ethnographic research results had an impact on organizational structure, new product development, relationships with equipment manufacturers, marketing and advertising strategy, and the corporate culture. A new strategic planning group was formed to create and support a digital content creators market, and the work enabled Intel to expand the market for high-end PCs through new marketing messages and products (Figure 8). The digital content creator team was able to use the research results to help activate an ecosystem with key OEMs in the industry. In one example, Intel shared the research results with an important OEM customer. The OEM subsequently shared extensive research of their own with Intel leading to a deep level of end-user understanding that helped define features for an all-in-one computer product designed for digital content creation in the Chinese market. The research also led the marketing and advertising teams to create campaigns tailored to content creators, keeping in mind the segment was more creative, and less technical than previously thought. Intel partnered with a key independent software vendor to develop a marketing campaign using members of the content creation community (Figure 9). The campaign featured real-world content creation case studies based on the ethnographic research, and did not highlight technical benchmarks, a primary component of most previous Intel advertising campaigns for high-end computers. A crucial element of the campaign was a series of video portraits of key influencers from the Tech Whiz segment showing their work processes and tools. These highly polished video segments contained limited Intel branding and subtle marketing messages. The advertising campaign tag line was, “Intel Gives You the Power to Create Like Never Before.” The research had an impact on the culture of Intel as well. Inspired by the work of the Pathfinding Team, the market research team hired a consultancy to conduct ethnographic research, rather than quantitative research, in order to create a new segmentation of gaming enthusiasts. Figure 8. Intel web site updated with focus on digital content creators. Figure 9. Intel marketing campaign in partnership with OEMs focused on creators. The case presented has two important points: (1) the necessity of understanding the rich textures of everyday life to create actionable frameworks, and (2) the importance of having an ethnographic research team in-house to keep a corporation capable of radical action in a dynamic world. Primarily relying on ethnographic research to create a segmentation was a new experiment for Intel. Flynn et al. (2009) demonstrate the value of ethnography in market segmentation, beyond what statistical measures can create, by bringing real people, real data, and real experiences into the creation of an abstract, but actionable, segmentation framework. The research demonstrated to the company that a computer, camera, screen, hobby, and job are not discrete entities, but are part of deeply contextual experiences. The digital content creators research validated the importance of including ethnographic capabilities in the equation of creating a market. Surveys, focus groups, and text analysis concentrate primarily on what people say about things they do, buy or use, but fail to grasp the underlying structures that govern the realities of experience. In structuring the segmentation of a new market, it was important not just to capture correlations but to understand causation. The “why” of practices and behaviors help set up the boundaries for the market, as well as best courses of action to create the market. Answering the questions of “What does it mean to be a content creator?” and “How does one become a content creator?” led not only to powerful personal narratives, but to the framing of a segmentation. The team's focus on both the social and cultural aspects of digital content creators helped to flesh out the market and move the work beyond individuals to the context of actions. While there were clearly differences in cultures, the team found the global communities of practice more influential in understanding the market drivers. The team created marketing and product recommendations separate from the segmentation to incorporate a more nuanced understanding of the cultural contexts of the digital content creators in places like South Korea, China, and the USA. This case exemplifies a key advantage of having an in-house ethnographic team - the team can act without having to be asked to solve a problem. The in-house research team is able to do this in part because the team has a depth of understanding about the company, its products, services, history, and future strategy, which is not possible for vendors brought in to address discrete questions. Because the team is immersed in the company all day, every day, they are attuned to the company, its mission, values, and culture. In day-to-day interactions the Pathfinding Team had created trusted relationships with decision-makers that created openings for introducing alternative perspectives. Further, as evidenced here, in-house ethnographic research teams bring a wide range of previous work that can be reframed to be pertinent to the corporation's current discussions, and can create informed, historical perspectives on strategic developments that often seem to operate ahistorically in ways that risk missing critical shifts. In this case, for example, previous research pointed to an overall shift from content consumption to creation, suggesting the professional standing of creators be deemphasized in relation to technical orientations when trying to understand the market. In other words, because the Pathfinding Team was able to bring to the table a history of studying digital content creation, it was easier for them to see the breadth of that shift, and the ways it brought content creators into the market who were different from the company's vision of creators with high technical needs. Finally, internal research teams are not necessarily “given” a problem, but can develop their own point-of-view on a topic. External agencies can execute flawlessly when given a problem, whereas in-house research teams can reframe discussions and prevent the need for agencies to solve problems. While in-house research versus outside agency research offers trade-offs, a corporation that has a blended approach, like Intel, creates the greatest advantage for success. Susan Faulkner is a Senior Researcher and ethnographer at Intel Corporation where her work has focused on understanding the future of connectivity, the needs and practices of digital content creators, the engagement of girls and women with technology through making, and the role technology plays in daily social transitions. Acknowledgments – The authors would like to thank Maria Bezaitis, the driving force behind the project; Muki Hansteen-Izora, their teammate; David Kennedy, their key collaborator and stakeholder; and their intrepid research partners in China and South Korea, Afra Chen and Soo-Young Chin. They also wish to thank the many research participants who generously shared their time and their insights with the team. 2004 A Consumers’ Republic: The Politics of Mass Consumption in Postwar America. Journal of Consumer Research 31(1): 236-239.